Stuck on your wedding vows? Beat writer’s block and get back to basics by choosing our men’s gold-plated tungsten “Love Forever” ring as your wedding band. 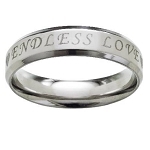 This stylish band features a “Love Forever” script engraving for timeless appeal. With a contemporary flat-faced design, you will radiate sophistication anywhere you go. Our gold-plated tungsten “Love Forever” ring offers every groom the best of both worlds. Tungsten is one of the hardest materials in the world, and it provides extreme scratch resistance. Combine that with a lustrous gold plating, and any groom will be gleaming as his soon-to-be-spouse walks down the aisle. Looking for titanium quality while staying true to your budget? 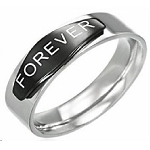 Our men’s gold-plated tungsten “Love Forever” ring is the perfect solution. Tungsten is the most popular alternative to titanium. Yellow gold is, historically, the most popular metal used for wedding and engagement rings. Our gold-plated tungsten “Love Forever” ring’s buttery metal plating achieves both contemporary and vintage-inspired appeal, so it’s perfect for the traditionalist as well as the contemporary man. Using extra metal, we designed this ring with a comfort fit band to accommodate larger knuckles. Comfort fit tungsten rings usually run 1/2 size larger, it is suggested you buy a half size smaller than your standard ring size. We recommend having your finger measured for a comfort fit ring at your local jewelry store for an accurate fit. All of our tungsten rings come with a lifetime warranty. This is a totally awesome ring, very heavy, solid, I would highly recommend this ring for anything. I normally wear a 101/2, this was an 11 dur to the comfort fit, works for me. This is a lovely ring and my man is very proud to finally have something on his finger that actually fits properly. Good service, pleased with ring. Bought two. I got this for my boyfriend and he absolutely loved it. Shipping was great and on time. Very happy with my purchase and will shop here again.